Next up, a blazer that I know will be carrying me through the summer. As I said in my review post, I’ve always liked the Liberty prints in concept but have never actually purchased anything in the print. There was something about this one that spoke to me. And once I got it home and paired it up with things in my closet, I realized I had a lot of outfit options with it. With blues, reds, pinks, and olive in the blazer, I already have four or five different combinations planned for this blazer. I also love that it’s lightweight but structured and it’s lined in a pretty pink pinstripe print. 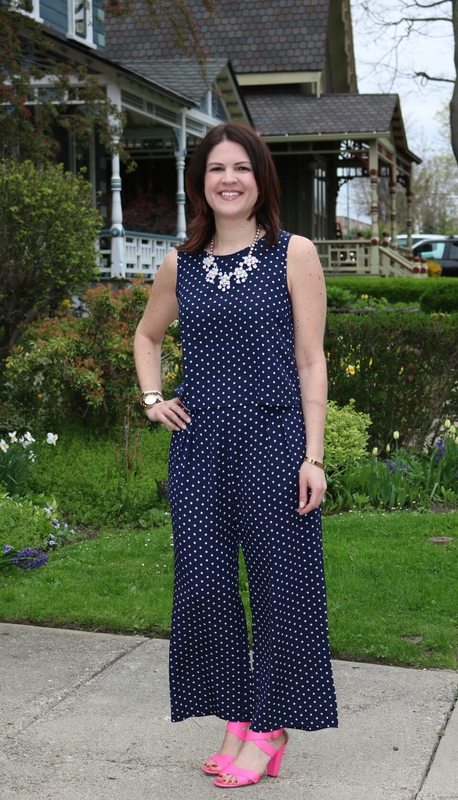 The pants I’m wearing are the Banana Republic Avery which are a current favorite – lightweight wool. And this tank has been in constant rotation on the weekend with jeans and a leather jacket to go out for a quick neighborhood drink or dressed up with a skirt or dress pants for work. This necklace was an impulse buy and it was my first time wearing it with this outfit. I love a good shift dress and J.Crew Factory has had a solid assortment of summer dresses. I’m usually not one for blue but in an effort to branch out from my usual color choices and replace a similar dress from last year, I opted for this bright blue. I think I don’t always pick blue because I never know what to wear with it. 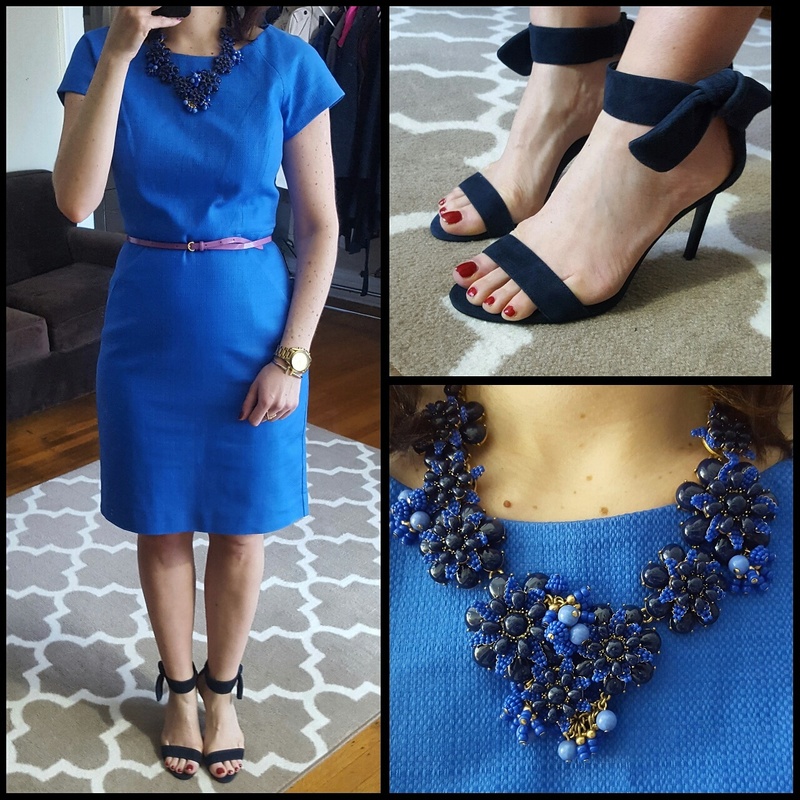 I started with the necklace and then kept with the monochromatic theme with the navy shoes. These shoes were a steal at Banana Republic and actually incredibly comfortable. I only have so many belts that fit these days so I liked the pop of pink as a contrast to all of the blue. This dress comes in a blue and coral color as well. Next up, a little bit of a hazy photo but this tie neck top…I’m in love. 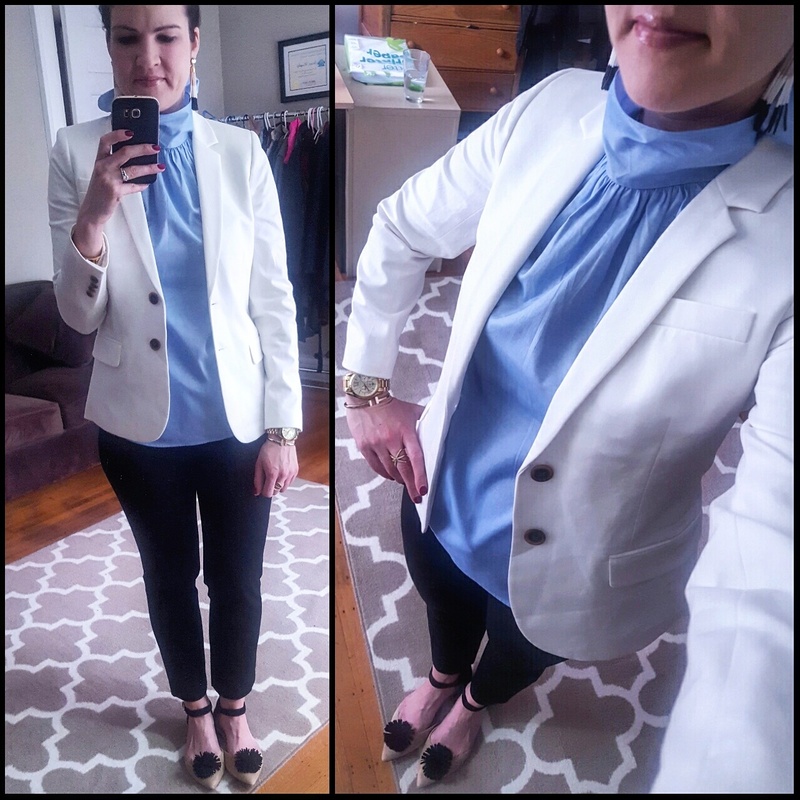 It was hard to get a good photo but I put the bow out the back of the blazer and the white blazer was the perfect finishing touch with the tassel earrings and coordinating shoes. I love that this top is polished enough for work but fun with white jeans for the weekend as well. I sized down in the top. Last up, a casual outfit that I wore last Friday when I was off from work. I picked up these pants in the sale section at J.Crew lately and I love how soft and lightweight they are. They have a zip fly but elastic waist and they’ll be perfect for summer. I’ve always liked olive pants on others but I only have so many occasions to wear them. This combo will probably be on repeat. My stripesick self recently picked up the short sleeve version of the deck stripe tee at J.Crew and I absolutely love it. It’s slouchy, so you can definitely wear your regular size for a relaxed fit and size down for a less relaxed fit. Oh…and these sandals. I always go crazy buying sandals at the beginning of the summer and these were a great deal. I think they’ll be a regular all summer. I personally love all of the ankle wrap styles and these are no exception! They’re very flat but I wore them all weekend last weekend and found them to be very comfortable. Now, for my summer wardrobe challenge. 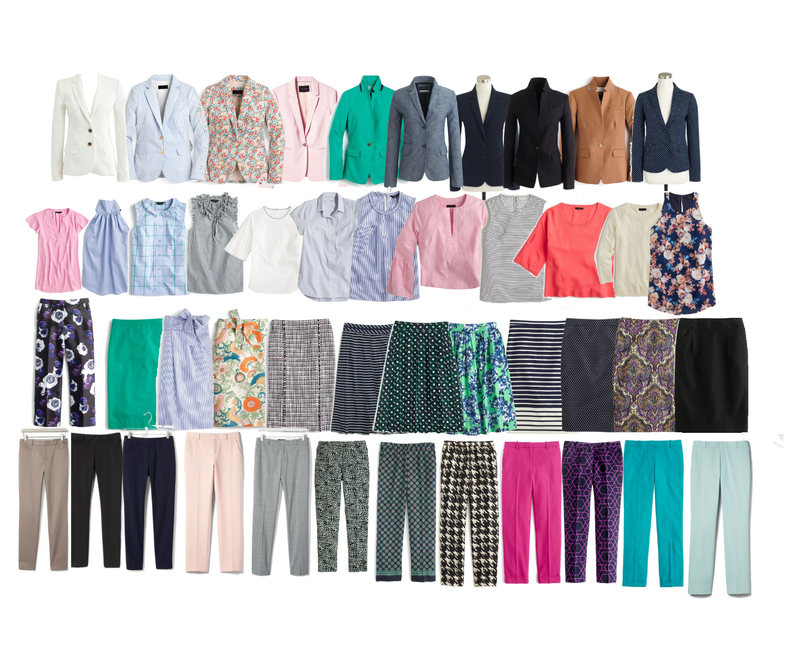 When I was at J.Crew a few weeks ago for my try-on marathon, I was chatting with my SA about what to buy / not to buy and was lamenting over wanting a pair of pants that were sold out in the size I needed. She pointed out a few items that I’d already had to return/exchange for smaller sizes and didn’t want to see me buying things that would go unworn. She made a good point. While I am thrilled with how far I’ve come, I’m still not to my goal weight. Without poaching my other planned post about rebuilding a wardrobe, I bought ton of new clothes at once to accommodate my new size, only to end up not wearing some items before I jumped to a new size. Taking all of that in to consideration, I started to think about how many summer clothing items I’d sold in recent weeks that I’d only worn once or twice. The summer season in Western New York is relatively short. It’s beautiful, but short. And then I started to think about how many summer clothing items I’d accrued in recent weeks. I sat down on Polyvore and started to tally everything up. Then I counted up how many weeks of summer we have and how many working days I’d need to account for. I decided to take the Memorial Day to Labor Day timeframe to work on a closet remix / wardrobe challenge of sorts. But I know going cold turkey on shopping for that long is a stretch for me. I’m sure I could do it but I decided to turn it more in to an incentive towards saving up for fall and winter clothing. Similar to my diet/weight loss struggles, one thing I’ve never actively tracked is my spending on clothing. Yeah, I pay the bills and life goes on but not until recently did I really start taking stock of what I was spending on things. So, in the spirit of accountability, I am going to start keeping track of what I’m spending weekly. I’ll start the week with my savings allocation, factor in any clothing resales (eBay/Poshmark) and any purchases and whatever is left at the end of the week gets transferred to a savings account to build the fall wardrobe fund. I am also still doing Rent The Runway unlimited so that will be used to supplement work week and weekend clothing as well. I’ll try and check in weekly or bi-weekly here with my progress and share how I’m doing. Here’s a glimpse of the summer work wardrobe closet. I think I have a lot of good pieces to work with and without really planning it, I have gravitated towards a color palette. When I look at this, I realize I have a pretty decent summer wardrobe to choose from. This doesn’t even include my dresses, shoes or sweaters! The biggest challenge for me will be doing less online browsing as that’s when I’m most tempted to buy. I am hoping by keeping track weekly I can make smarter decisions about what’s being added to my closet. So, how about you? 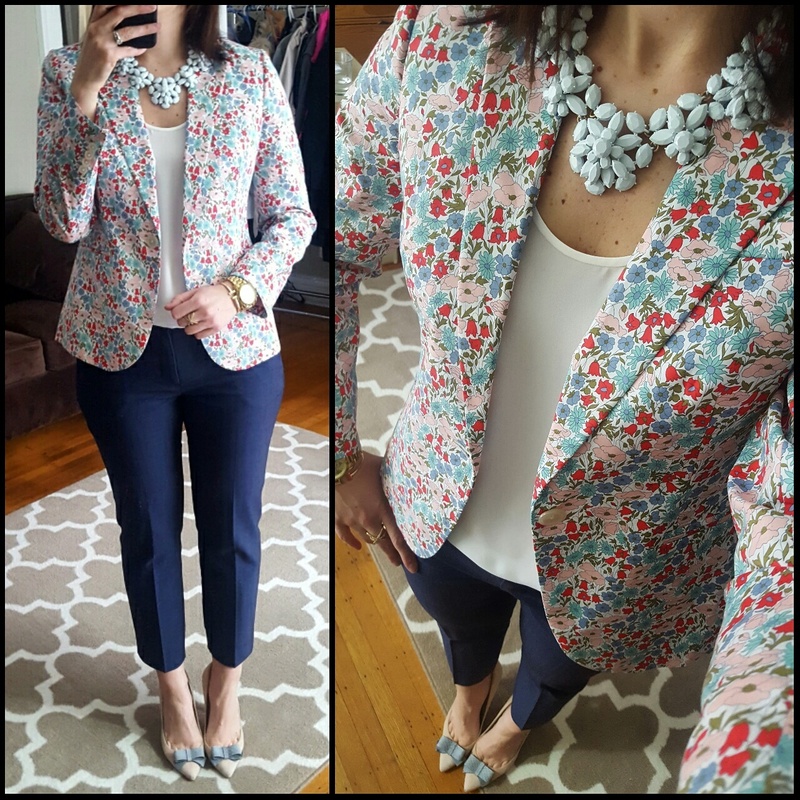 Any favorite outfits or what are your thoughts on your summer wardrobe? Would love to hear what you think about the challenge and thanks for visiting!